The large studio is located on Santa Gertrudis Lane in Tumacacori. The location is absolutely perfect for those who enjoy nature, hiking, birdwatching, gallery hopping, horseback riding and experiencing the historic West. This area of Southern Arizona is just teeming with history. Our property was the location of a stage coach stop between Nogales and Tucson. The Tumacacori Mission borders two sides of our 8 acre property giving our visitors a peaceful retreat and opportunities to easily explore the mission, the De Anza Trail Santa Cruz River and Tubac. Tubac is a pleasant 4 mile hike or bike ride away. Tubac is known as the place where "Art and History Meet" There you will be able to visit over 100 galleries, restaurants and stores. Tubac also has a state park and museum where you can explore more of the history of our area. The Studio has a full bath and kitchen complete with a bar for dining. The studio accomodates 2 people in 2 twin beds. There is an unheated pool on the property which is perfect for cooling off and rejuvenating after a day of exploring. Pets are welcome. We also have facilities for boarding horses. All of our Casita's have been recently renovated. We offer our guests accommodations that not only fills their need for a place to stay but is also a soothing experience where they can renew their spirit. My husband and I fell in love with this property located just outside of Tubac and off of the Santa Cruz River. We were bewitched by the history of the property and were compelled to renovate the buildings. We have put unique touches in each of our offerings to soothe our guests and renew their spirit. We are woodworkers and our studio is on the premises. We create functional art with local mesquite wood. I enjoyed it and really liked the owners but it really is a work in progress. It has great potential but isn’t quite there. The WiFi was our biggest issue and if that were improved it would make a world of difference. I liked being out in the country with animals around and easy access to the Anza trail. There were a few mechanical glitches that occurred but all were quickly solved. I believe they are in the process of fixing most things and hope they will continue. They are creating a great group space that can be used by all. It was great having the two of you as guests. Let’s keep in touch and I’ll let you know when we expect to be back East. Thanks again for visiting with us. Me and my dogs really enjoyed the property. The cabins are clean, cute and cozy! There are several trails to take walks and pretty wash 5 minutes away. Totally recommend it! I spent three nights here this winter on a trip to the area to visit museums and do some motorcycle riding. Plenty of room to unload/store/load trailer. The owners were very accommodating and quickly addressed any issues that came up. The location is out of the way and surrounded by mature trees with a creek/river crossing nearby. The accommodations were clean and organized. I would definitely stay here again. Thank you for the lovely time at your darling casita.You made us feel so at home and welcome. 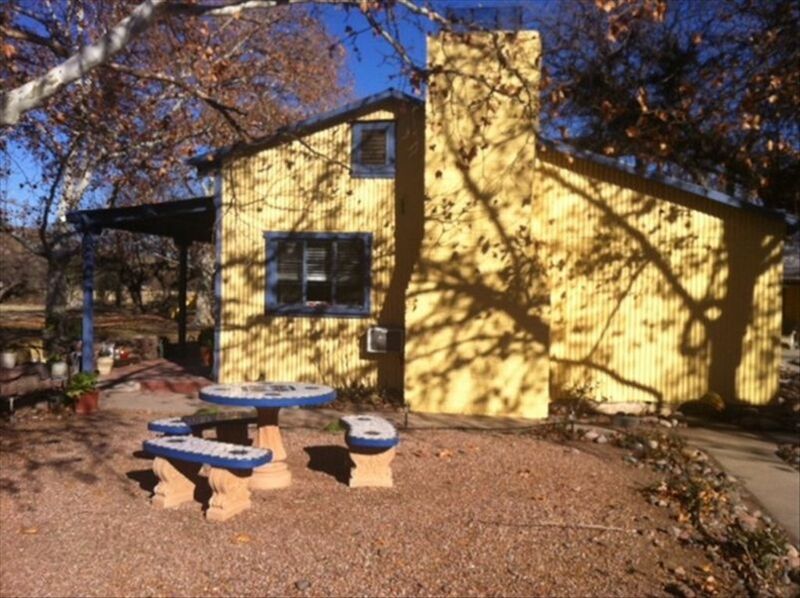 The location is super...near Tubac but on 10 acres of lovely rural countryside. We would recommend this place to anyone! It was great to meet the two of you. I am pleased that you were able to enjoy Tubac’s luminaria night as well as the Tumacacori missions Fiesta. Have a great Holiday. The studio sized guest house was just perfect for two of us! The owners have various animals on the property - from chickens to goats - that we enjoyed! Also, we were steps away from the Anza Trail and the flowing Santa Cruz River - perfect for a hike and some birdwatching! Owners are wood artists and were very pleasant and accommodating.